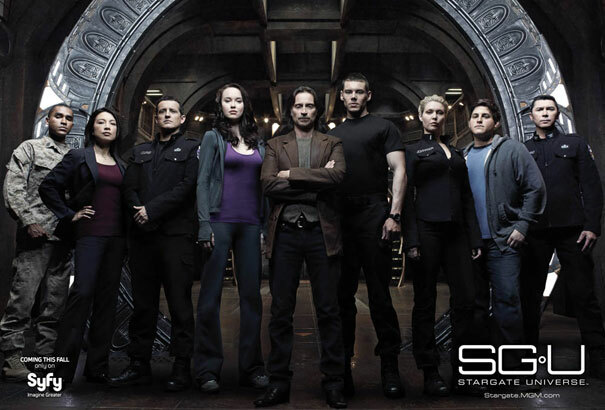 Ok first of all I have to get out my excitement about Stargate Universe, the third show in the Stargate TV franchise. The 2-hour series debut will hit your screen this Friday at 9pm (8pm Central) on SyFy. io9 posted a fairly revealing clip from it today. Don’t get me wrong, no real spoilers there, just a good idea of the vibe and overall tone of the show. This series will be a much more serious take on the Stargate saga. I’m thinking it’s going to end up taking on a similar mood to Battlestar Galactica. Ok now that’s out of my system…. I’m sure you’ve seen the headlines about how water was discovered on the moon recently by NASA’s mineral mapper instrument aboard India’s Chandrayaan-1 probe launched in 2008. First of all, this does NOT mean that water is swirling around on the surface of the moon. The moon has no atmosphere and therefore water can’t even exist in a liquid state at all. What’s happening is that the incoming solar rays are reacting with the material on the surface to create a thin layer of hydroxyl (OH) and normal water (H2O) in the very top milimeter or so of regolith. This layer is so thin that it would amount to 1 liter of water per ton of surface soil. That’s a VERY small amount, but it’s a lot more than we ever thought would be there. What does this all mean for the future of human exploration on the moon? Read this Universe Today article to find out. Here is a great Daily Galaxy article about something that I had honestly never even heard or known before. I hadn’t the slightest clue that there are more bacteria/microbes in our bodies than there are actual human cells. That’s to say that if you counted the number of human cells and the number of microbial/bacterial cells in your body, there would be more bacteria/microbes. In fact it’s utterly awe-inspiring (and slightly terrifying) to think that some of the species if bacteria actually don’t exist anywhere else outside our bodies, and that we could NOT survive without them. Essentially they’re as important as any organ. We’re literally more germ than we are human, and it couldn’t exist any other way. Of course, we look more like us because human cells are MUCH bigger than bacteria cells. The crazy thing, as the article points out, is that doctors still don’t know anything about most of these bugs that live inside us. But they’re trying to change that.